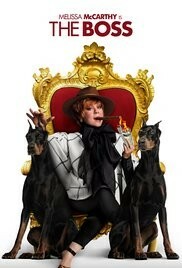 Based on a character that Melissa McCarthy created for the prestigious Groundlings Comedy Troupe, THE BOSS (2016) was finally brought to the big screen by Universal Studios. Although developed by a talented comedian, this movie falls flat right after the opening dance sequence. The laughs feel forced and the ensuing slapstick comedy overused in inappropriate situations. A disappointment considering the talent behind this character’s conception. When successful business woman Michelle Darnell is charged with insider trading and sentenced to Addison Correction Facility, her release back into the community proves to be a further struggle as she quickly realizes that she has no idea how to continue life without her wealth. Desperately attempting to renew old contacts, Michele begins working on a plan to claw her way back up to the top while simultaneously realizing just how many people she stepped on during her first rise up the corporate ladder. After an hour and twenty minutes, one glaring question continued to plague me about THE BOSS (2016). Why in the world was Melissa McCarthy sporting a mirage of outfit-matching mock necks pulled right up to the bottom to her chin line? By the end of the movie, I have to admit that if I could have, I would have reached right up and ripped them all off her neck. An obvious distraction only fed by my lack of interest in the movie’s predictable plotline. THE BOSS (2016) is a movie only worth purchasing from the sale bin and I would never consider paying full price at a theatre for this failed comedy. Directed by Ben Falcone, Rated R, Comedy, 99 Minutes, Released Apr, 2016, ** 2 stars out of 5.